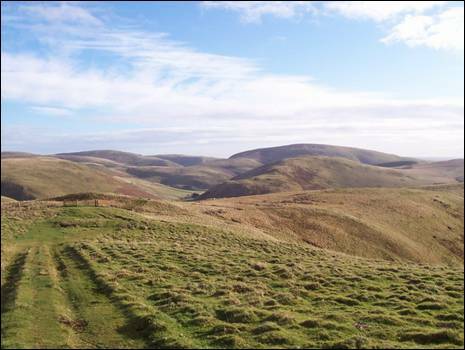 Standing at a height of 619 metres above sea level, Windy Gyle is the fourth highest of the Cheviot Hills. It has been described as both enigmatic and one of the most shapely of all these wild, northern hills. It stands astride the border between England and Scotland and has been visited by a virtual army of long distance `foot soldiers` who have stepped out along the Pennine Way in search of the ultimate prize - journeys end! The Rowhope Burn trickles into life on the steep north western slopes of Windy Gyle before turning towards the south and a distant rendezvous with the River Coquet. This walk takes you on a horseshoe journey high above the secluded valley of the Rowhope Burn. It crosses the often ignored tops of Loft Hill and Swineside Law, as well as leaving its footprints on the Bronze Age burial cairn crowned summit of Windy Gyle. There are outstanding views throughout. 1. The 6 mile journey from the tiny settlement of Alwinton to the starting point of the walk at Slymefoot is difficult to beat. As the single track road twists and turns through Upper Coquetdale, it passes some of the most beautiful scenery Northumberland has to offer. In his 1950 book, `A Guide to the Cheviot Hills`, F. R. Banks wrote, “Though the road now extends as far as Blindburn, 9 miles above Alwinton, it is not so many years since the major part was a mere cart-road, unfit for cars if not for cycles”. Even in 1950, the journey up the valley was not without its problems. “In little over a mile from Alwinton”, wrote F. R. Banks, “is the boundary of the Redesdale Artillery Range, where private cars, having no specific business up the dale, may find themselves stopped when firing is in progress”. Where the Rowhope Burn enters the River Coquet, caught between the steep flanks of Barrow Law to your right and Tindale Law to your left, there is limited parking (NT 859114). The bridge across the Rowhope Burn is known as White Bridge and, in the 18th century an inn, which was supplied with illicit spirit from stills hidden in nearby cleughs, stood on the opposite bank of the burn. It was, by all accounts, a den of iniquity. The immediate area is known as Slymefoot, time now to drink up the views. Do not cross over the bridge, instead take the tarmac road which hugs the Rowhope Burn and, eventually, leads to the remote farm of Uswayford. In 1950, this road was still just a track. With little more than ½ mile of easy walking under your belt, the almost pristine farmstead of Rowhope is reached. 2. Like all farmsteads in Upper Coquetdale, the two-storey house would have once used dried `peats` for heating and a thatched peat stack, standing near to the farmhouse, would have been an everyday sight. In 1913, the Third Edition of the Ordnance Survey map of the area showed the road, described as `unmetalled` and therefore nothing more than a mere track, continuing to follow the Rowhope Burn north westwards, eventually joining `The Street` on the lower slopes of Black Braes. The route towards Uswayford was by way of a footpath, linking with the cross border track of Clennell Street at the base of Hazely Law. Once past the farm, cross over the cattle grid and, immediately beyond the dry stone wall (NT 853122), a faint quad track climbs the steep grass covered slope to your left. Take this track which, as the gradient eases a little, continues its upward journey alongside a dry stone wall. Already the views are opening up southwards, with Shorthope Hill and Hindside Knowe rising up from the receding valley floor and Tindale Law and Shillhope Law visible in the background. When the wall meets a fence, cross over the step stile and continue straight ahead on a track which contours Stob Hill and rises gently as it heads onwards. On the opposite side of the quiet valley lies `The Street` and your high level return route. At the next step stile, cross over, turn right and, keeping with the post and wire fence, climb steadily towards the summit of Loft Hill. 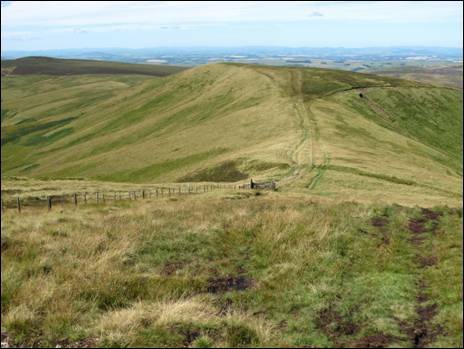 On reaching fairly level ground, re-cross the fence and head the short distance to the unmarked summit of this grass covered hill (NT 849131). 3. Standing at a height of 450 metres Loft Hill enjoys good views. Now return to the fence, re-cross and continue on your original course. After a short downhill stretch the path soon begins to fade so you will need to clamber back over the fence to join a track on the other side. As the gradient steepens so the ground becomes rougher and heather cover is the norm. The fence now remains on your left hand side so it is just a simple matter of choosing the best route possible across increasingly boggy ground without drifting too far away from the guiding fence. Before long the substantial summit cairn of the fourth highest of the Cheviot Hills will appear in the distance. However, first you will cross a gravel track literally cutting through the hillside on a north west/south east course. This track is not named on the current Ordnance Survey map although many earlier maps had referred to this track as Maiden Cross and, indeed, this was one of the seventeen border crossings listed in a state paper of 1543. 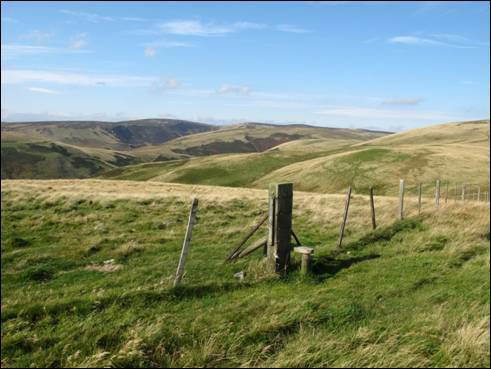 Keep with the post and wire fence and on reaching the next one, which forms the border between England and Scotland, cross over and cut diagonally to your right to reach the 619 metre high summit of Windy Gyle (NT 855152). The hills and mountains of England and Scotland, categorised by reference to a range of different and, in some cases, complex criteria, have been the subject of a vast assortment of lists. The oldest and best known list, the Munros, relates to those mountains in Scotland which are over 3000 feet in height, whilst other well known lists are, Corbetts, Wainwrights, Marilyns, Nuttalls, Hewitts and Donalds. 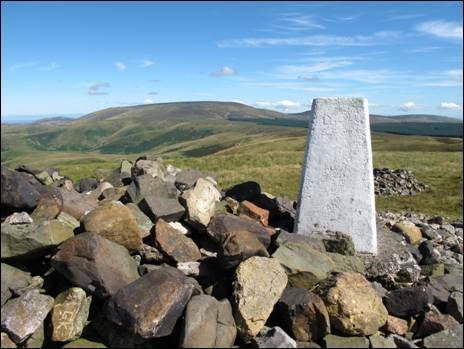 The border-straddling Windy Gyle appears in three separate lists, Nuttalls, Hewitts and Donalds, and holds the unique distinction of being in lists of both English and Scottish hills. This is most definitely a hill with dual nationality. The weather hereabouts is, well……….windy, a fact which has been highlighted in many written accounts of this elevated spot. In his 1926 book `The Border Line`, James Logan Mack wrote, ”Beyond the `col` ahead on a bleak New Years Day was Windy Gyle, and never did it better deserve its title”. By 1976, when `Pebble Mill at One` presenter Bob Langley passed this way, the weather had not improved one iota. He wrote, in his fine book, `Walking the Scottish Border`, “I have never been there when a gale has not been blowing, ” adding, “ I stood on Russell`s Cairn as the wind ripped into my face with the fury of an express train”. Thirty years on and another case of déjà vu, as broadcaster Eric Robson recounted, in his book `The Border Line`, how, “It was blowing a hooley by the time I got to the cairned summit of Windy Gyle”. You have been warned, so be prepared to sit with your back to the wind and enjoy the all round extensive views. 4. Time to press on. So, with the triangulation pillar and cairn behind you, take the path which heads in a westerly direction across the flat summit. This is the route of the Pennine Way and, as the path begins to drop downhill, the border fence is reached. At the next stile, take the opportunity to cross back into England. As you descend, the views of Windy Rig, to your right, and the valley of the Rowhope Burn, to your left, are particularly outstanding. 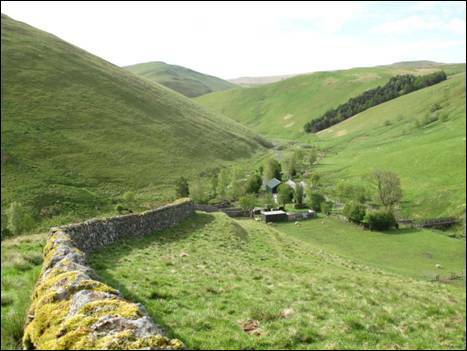 Once across the saddle separating the Rowhope Burn, on the English side, and the Gyle Burn, on the Scottish side, your path begins to bend away from the border as it heads towards Foulstep Sike before climbing across rough ground to meet `The Street` at Plea Knowe (NT 835150). `The Street`, an ancient cross border drove road shown on General Roy`s 1775 map as `the Clattering Path`, is now a `green` track providing excellent high level walking. The signpost points you towards the `Coquet Valley`, to the south. You are now heading across Black Braes with the Easthope Burn, to your right, and the hidden Rowhope Burn, to your left. 5. After a short stretch of fairly rough track, pause a moment at the gate before you begin the rapid descent of Black Braes. The view southwards, towards the bulk of Shillhope Law, offers a perfect excuse to catch your breath. Now head downhill and once across the sheltered col, step over the stile and follow the track as it rises across the slopes of Swineside Law. `The Street` does not cross the actual summit of this 457 metre high hill so, on reaching the 440 metre contour (NT839131), where a small stile crosses the fence to your left, be sure to make the short detour, to your right, to claim the third top of the walk. A faint track leads you there and back before continuing your journey south over flatter ground, with the post and wire fence always to the left. The fence hugging path skirts Bought Law, so be sure to take the green track which heads straight for the top and, whilst barely higher than the surrounding ground, the view from the summit is well worth the extra gram of effort. Continue across The Slime to rejoin the main track as it heads downhill across Hindside Knowe and the boggy ground surrounding the infant Dreary Sike (NT 852115). Keep with the fence as it makes a left hand turn and, on reaching another stile, step over. 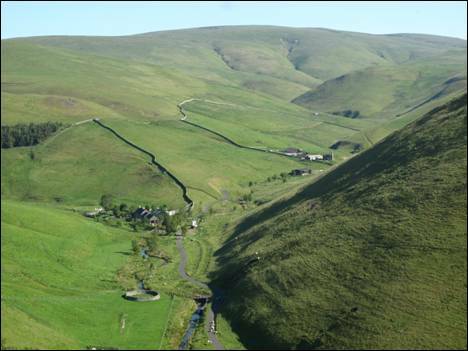 You now have a `Royal Box` view of Upper Coquetdale and the surrounding hills. The River Coquet wriggles between the near vertical flanks of Tindale Law and Barrow Law, whilst to the north, the farmstead of Rowhope and your outward route can be easily picked out. Now, it is all downhill and on reaching the gate and the small stile on the valley floor, cross over and turn left. You are now back beside the chattering Rowhope Burn as it slips effortlessly beneath White Bridge and joins the glorious River Coquet. Journey`s end in more than one sense! Slymefoot (White Bridge), Upper Coquetdale (NT 859114), (NT 853122), (NT 849131), (NT 855152), (NT 835150), (NT839131) & (NT 852115).